My family and I were fortunate enough to sail on the inaugural Star Wars Day at Sea on Disney Cruise Line, and it was, spoiler alert, AMAZING. I was there as invited press, and my take on the overall experience can be found on GeekDad. However, there was far more happening on the cruise than I could fit in one article and I would be remiss not to discuss it further. Yes, I’m talking about t-shirts. 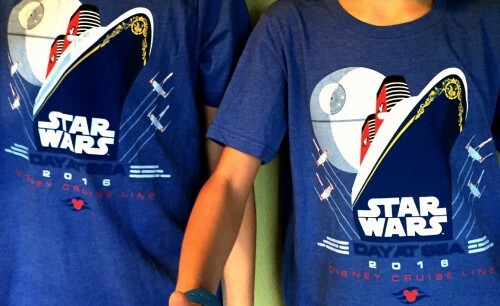 Seriously, the Star Wars shirts worn by Disney Cruise Line guests, just like everything on the ship, were next level stuff. I took as many photos as I could, which was kind of weird at first, but after a few pictures I realized that people were more than happy to pose—before long I was the “shirt guy,” and I’ve been called a lot worse. Note: I included both “fan” and “official” shirts in the gallery. The photo quality isn’t always great as many of them were snapped in elevators, hallways, and assorted places you tend to pass through quickly. Also, I may have had a beverage in my hand. And on that note . . .